Short on clothes but long on intrigue, Willie Willey and his choice in dress (or lack thereof) made an impression on twentieth century Spokane. Born in 1884, Willis (Willie) Willey grew up in Iowa but moved to Spokane in 1905. As a young twenty year-old man he worked odd jobs to support himself including farming, hunting, and fishing. In 1920 Willey purchased a forty acre plot of land just east of Hillyard to be his permanent home and sanctuary. This ordinary life changed to extraordinary shortly after his move. 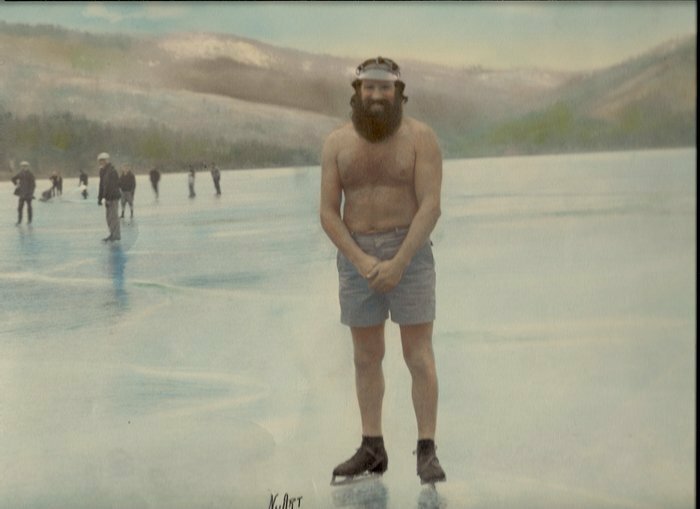 There are many stories about why Willie stopped wearing clothes. Some say it was the death of his mother, others claim it was a dispute with his church, still others claim a failed romance. Whatever the reason, Willey stopped wearing traditional clothing in favor of khaki shorts. In all weather he stuck to this uniform only adding a green sun visor in the summer and rubber boots in the winter. Spokane area newspapers began paying special attention to Willey because of his appearances in court wearing only khaki shorts and a long beard. He became involved in a dispute with a nephew over his property, his nephew suing him for $141.70. Willey refused to pay and in return the court ordered his land sold at a sheriff’s auction and Willey to serve jail time. This was just the beginning of his problems with the law. After serving jail time, and his property sold to another owner, Willey refused to leave the land he believed was rightfully his. The new owner took issue with this and continually contacted the police in an effort to remove Willey from the land. In 1933 Willey decided to get out of Spokane for a time and travel across the country to the World’s Fair in Chicago. His plan was to sell photographs of himself along the way and at the fair. Willey was not met with open arms in many of the cities he visited, spending time in jail in both Portland and Chicago. Because of his arrest, Willey did not get to spend much time at the World’s Fair but he headed on to his home state of Iowa to visit family and hopefully escape further persecution. Willey headed back to Spokane and to his former property in 1940. 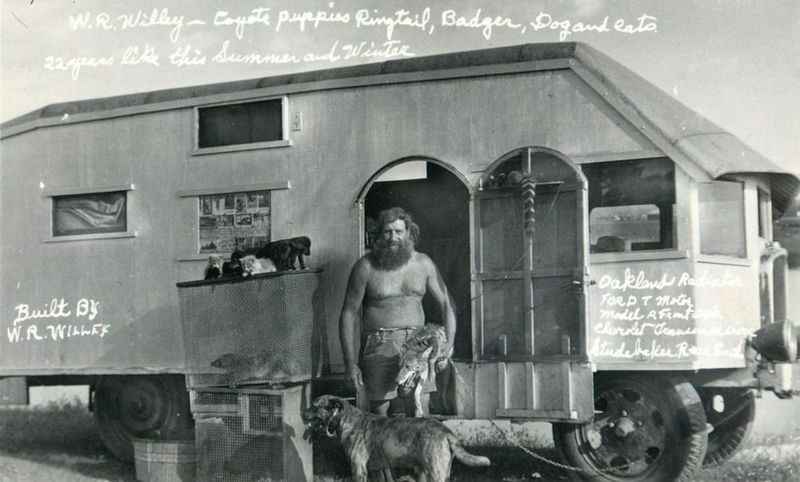 After turning his truck into a camper he left again in 1946 with his pets: one coyote, one bull snake, two dogs, five skunks, six white rats, and twelve guinea pigs. He again returned to Spokane in 1951, having added a few more pets to his entourage. They lived out of his camper while Willey went back to work attempting to recover the land he once owned. Willey was never able to regain ownership. On May 13th, 1956 Willey died in a car accident at the age of 72. Known across the country as “Spokane County’s Wild Man” this eccentric individual's death was reported as far as Ottowa, Canada. Long gone, Willie Willey has not been forgotten. In 1978, a large rock in the Spokane River was named Willie Willey Rock. And in 2015, a new mural at the corner of Division and Sprague features a smiling Willie-with a strategically-posed marmot in front of him, symbolizing Willie’s love of nature and covering what he would not. Willey Ice Skating: This postcard shows Willie Willey ice skating on Liberty lake in the Spokane Valley. Even in the cold Inland Northwest winters, Willey stuck to his uniform of shorts and a visor. He claimed his health had improved since shedding his traditional clothing. 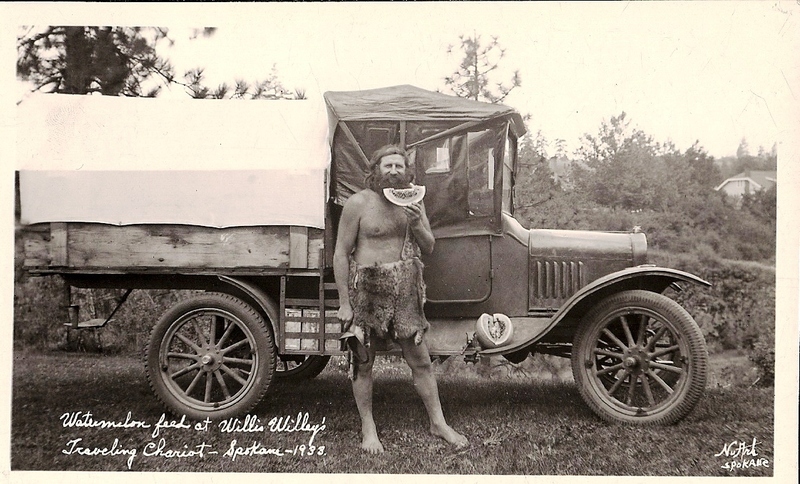 "Willie Willey's Traveling Chariot": This image shows Willey eating watermelon in front of his makeshift camper and wearing an animal skin, instead of his traditional shorts. Willey sold postcards of himself to make money while traveling the United States. Willey and His Pets: Willey's eccentric persona extended into his choice, and the amount, of pets in his entourage. As Willey aged he collected more and more non-traditional pets including a coyote, possum, snakes, and a ringtail. 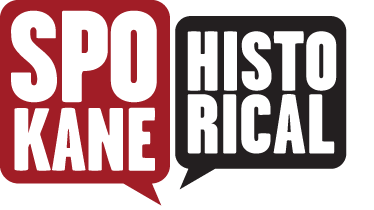 Allie Honican, “Willie Willey: Spokane's Nature Boy,” Spokane Historical, accessed April 20, 2019, https://spokanehistorical.org/items/show/642. Yates, Keith L., The Life of Willie Willey: Nature Boy, Traveler, Ambassador of Good Will (EWU Press, 1992). Clark, Doug. Spokane Chronicle. “Willie Willey is Surely Laughing At Spokane Now,” February 12, 1991. Hansen, Dan. Spokesman-Review. “City Honors Clothing-Optional Folk Hero Willie Willey,” January 12, 1995.